The interweb is buzzing with the resurrection of Jawa Motorcycles in India and we have to say that we like what we see. After a series of teasers. 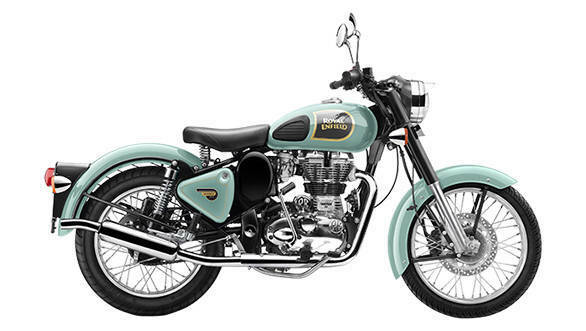 Classic Legends, a subsidiary of the Mahindra group has launched two, new 300cc motorcycles. One if called Jawa and the other is called the Jawa Forty Two. Both motorcycles share the same engine and frame with the only difference being cosmetic. The Jawa resembles the yesteryear's Jawa, down to the shape of the headlamps and tool box cover. The Forty Two, on the other hand bears a few contemporary bits that act as distinguishing factors. The Jawa is priced at Rs 1.64 lakh while the Forty Two is priced at Rs 1.55 lakh. All prices are ex-showroom. This puts the Jawas bang in the Royal Enfield Classic 350 territory. Royal Enfield is another brand with a rich heritage and has been steadily expanding its market share in India. The Classic 350, in fact, is its bread and butter model and has had an unchallenged run so far. But the prices of the new Jawas has brought the heat to Royal Enfield. Both motorcycles look like they belong to a bygone era, albeit with modern paintwork as well as fit and finish. The Royal Enfield Classic 350 looks quite basic, with simple fenders and a fuel tank. The paintwork and pinstripes are there, but to a minimum. The single pod instrument cluster houses an analog speedometer looks pretty retro a well but the omission of a fuel gauge in this day and age is not expected. All said, there are Royal Enfield loyalists as well Jawa fans and both bikes speak a design language that'll surely appeal to them. 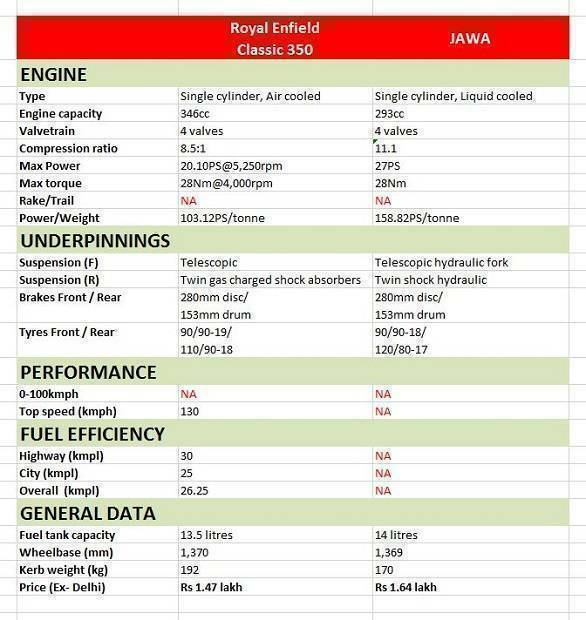 The Royal Enfield Classic 350's motor has a clear displacement advantage over the Jawa's 293cc engine. That said, it's the Jawa's motor that makes more power at 27PS, as opposed to 20PS that the Classic's unit makes. At 28Nm, both engines produce same amount of torque. torque. Also, while the Jawa may look all retro, it is the only bike here that features a liquid-cooled engine. It may seem like an oddity on a retro themed motorcycle but the positioning does not get in the way of the aesthetics. Considering the Jawa's 20kg lower kerb mass, we expect it to outperform the Classic 350. But we'll reserve a definitive judgment for the comparison test. Another area where the Jawa holds a slight advantage is gearbox. It has a six-speed unit while the Enfield has a five-speed box only. This should translate to a much relaxed cruising rpm in top gear. Both motorcycles employ a disc brake at the front and a drum brake at the rear. 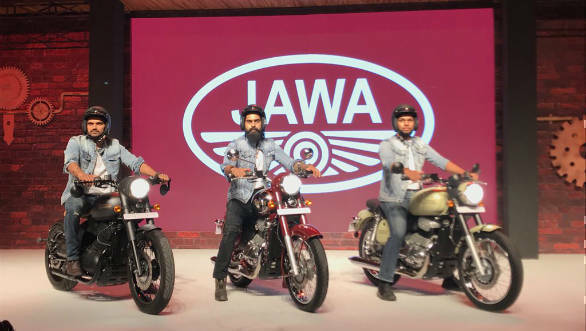 The amazing thing is that the brake sizes on both bikes are the same.The Jawa, however, comes with ABS as standard, while the Classic 350 Signal is the only model that comes with this feature. That said, Royal Enfield should offer the feature as standard post the April 2019 mandate. While we are looking forward towards pitting these two bikes against each other, here's a look at how they stack up against each other on paper.